↑ Campbell, G.S., and J.M. Norman (১৯৯০), The description and measurement of plant canopy structure. পৃষ্ঠা ১-১৯ In: Russell, G., B. Marshall, and P.G. Jarvis (সম্পাদক). Plant Canopies: Their Growth, Form and Function. Cambridge University Press. ↑ Parker, G.G. 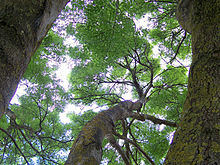 (১৯৯৫), Structure and microclimate of forest canopies. পৃষ্ঠা ৭৩-১০৬, In: Lowman, M.D. and N.M. Nadkarni (সম্পাদক). Forest Canopies. Academic Press, San Diego, CA.